Stir with ice and strain into a chilled cocktail glass. 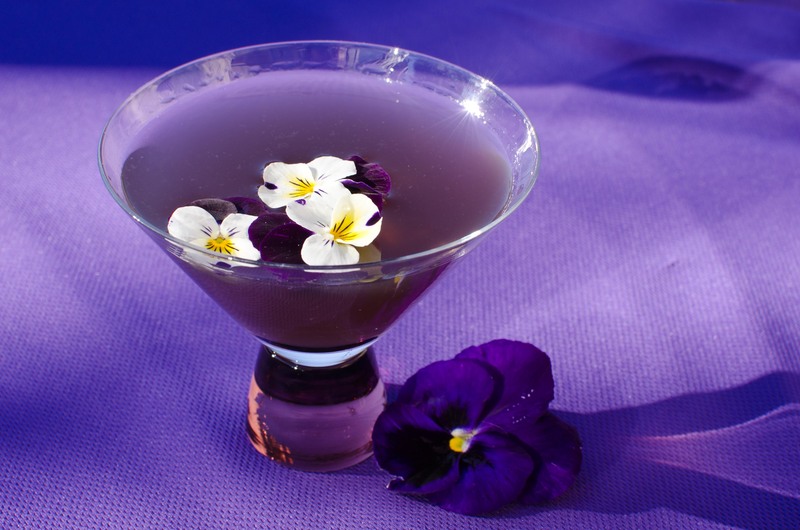 Garnish with a viola, violet, or pansy, if you wish. 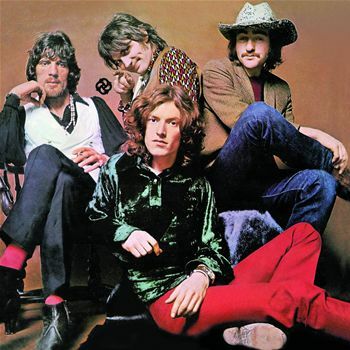 If you’re not a fan of the group Traffic, “40,000 Headmen” is from their eponymous second album, released in 1968, and it’s one of those classic deep tracks that everybody should hear at least once. In true ’60s form, you get a little cosmic flute action and a sense of dreamlike recollection — nothing especially psychedelic compared to the other music coming out of the studios at the time, but mystical, and pretty catchy. The tricky bit is coming up with a drink to match the song. My first thought was to use whiskey — what else would Old West mercenary-type headmen drink, after all? The second thing that came to mind was the Aviation, namely for its cloudy-sky tint. Cutting out the maraschino and making the drink with High West’s Silver Oat whiskey (2:1:1 ratio for whiskey:violette:lemon) resulted in a nice combination, if not one that was citrus-heavy and purple-grey. Figuring that I needed a whiskey that contributed a sturdier flavor, out came the Famous Grouse. Traffic is a British rock band, after all, so why not use Scotch? Another quick note: the full title of the song is “(Roamin’ Thro’ the Gloamin’ with) 40,000 Headmen,” and “Roamin’ in the Gloamin'” is an earlier song from 1911 with Scottish roots. “Gloaming” is, of course, a synonym for “twilight,” and the resulting drink comes out a smoky, purpley, stormy grey color that I rather liked. 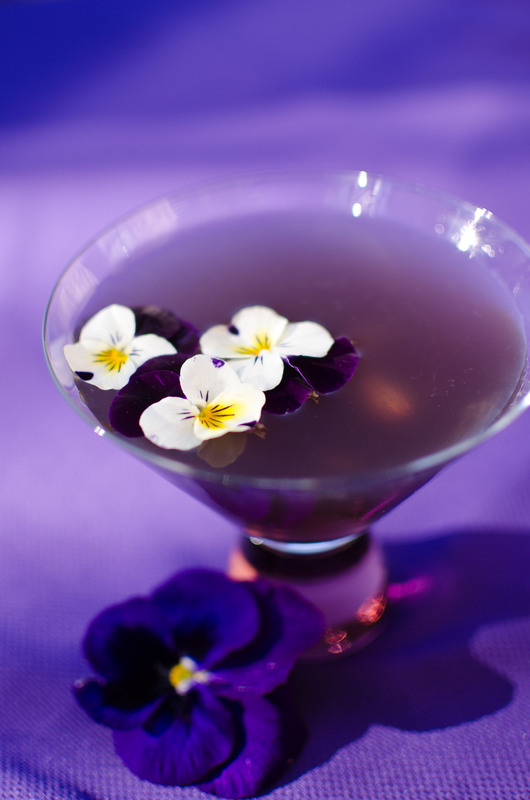 Instead of emphasizing the citrus, the use of Scotch amps up the perfume of the violette. I never would have thought to combine violette and scotch, but there you have it. Now, I tried using my McCallan 12-year sherry cask scotch in the 40,000 Headmen and the result was disappointing. The sherry flavors of this particular bottle tend to dominate every drink I’ve tried it in, and the 40,000 Headmen suffered the same effect. Not recommended, though I’d love to see what another single malt would do here, and an Irish whiskey substituted for the scotch would make a fine experiment. I also tinkered with Créme Yvette, first replacing half of the violette with it (resulting in a dusty-rose-colored drink) and then about a third of the violette (giving a near-perefct, reddish twilight color). The more Yvette you use, the more the the citrus comes through, reducing the perfume of the violette-scotch combination. A dash of Yvette provides the best flavor, I find. Finally, why stir the drink? Well, I didn’t feel like having all those agitating ice shards in it, nor did I feel like having any bubbles or foam form on top. Stirring chills just as well, if not more slowly, the lemon juice retains a suitable cloudiness, and the texture seems more velvety or creamy than that of a shaken drink. Now for a tangent. Some of you may be saying, “Hey, wait a minute, isn’t this just a Blue Moon with scotch?” Well, in a word, Yes. For those of you unfamiliar with the Blue Moon, the recipe includes gin, Créme Yvette/violette, and lemon juice. It’s an oldie (and a goodie) that I first encountered in Ted Haigh’s Vintage Spirits & Forgotten Cocktails. After checking out Paul Clarke’s post, it seems that he encountered the drink before the R&W violette came out, and his formulas come directly from Haigh’s quoted sources. Chuck Taggart of the Gumbo Pages also has a write-up on the once-obscure Violette and the Blue Moon. I’ve not tried the original Ensslin vermouth version, but it looks wonderful, especially as Doug Ford of Cold Glass describes it. I prefer the use of Yvette in the “modern” version, but the drink comes out, well, pink, so I call it the Pink Moon instead, which is, you guessed it, the name of a song (and an album) by Nick Drake. Photos by IJL, except for the album cover, found via Google. PS: Yes, I did cheat a bit on the photos, but only in the setup — the background cloth is a bright purple, and the stem/foot of the cocktail glass is a maroon-purple color. The white balance was corrected by sampling the white of the violas in the drink via Lightroom, but it didn’t undergo much alteration in the photos as-shot. The drink will be more of a gray in most lighting conditions. This sounds like a very interesting Blue Moon variant; I look forward to trying it. Thanks for the link back to Cold Glass! Thanks, Doug, and thank satellite radio for introducing me to the tune…yes, it does get stuck in your head, hence the drink! I enjoyed your Blue Moon coverage, and the photos. This entry was posted on October 29, 2011 by IJ Lauer in Creme de Violette, Creme Yvette, Drink Recipe, Lemon Juice, Original Drinks, Scotch and tagged 40000 Headmen, cocktail, creme de violette, drink, lemon, original, recipe, scotch.